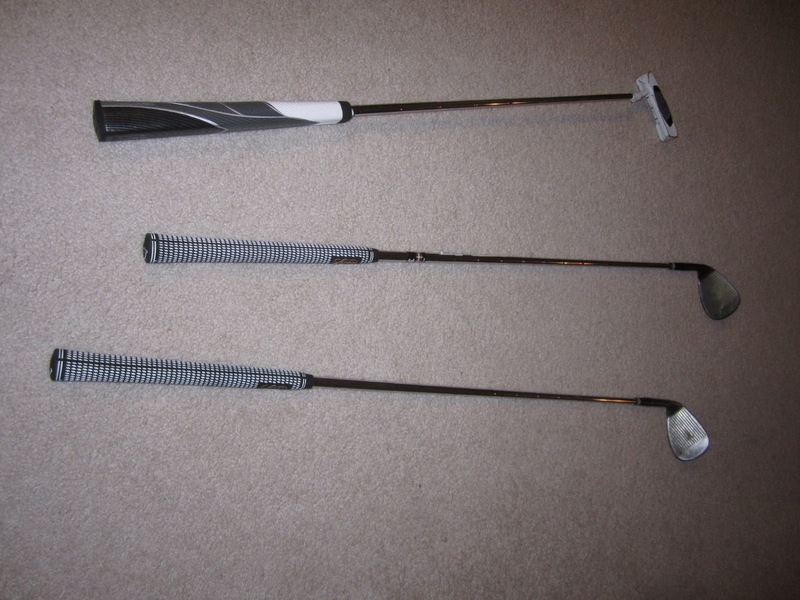 A Chance to Play My Newly Re-Gripped Clubs? With weather supposed to reach in to the 50’s tomorrow, and sun and low-to-mid 40’s on Saturday, this weekend could turn out to be my opportunity to extend my months golfed in Wisconsin streak to 23. I assume it depends on whether or not the snow melts, and could be a walking-only kind of round, but I’m sure I’ll take what I can get. It would also be my first opportunity to use my newly re-gripped wedges and putter. This week, I finally went through with trying out the wider grips on these clubs, in an effort to keep my hands straighter and decrease lateral movement on approaches and putts. I am really curious whether or not these will help, and especially curious whether or not the oversized grips on my 52- and 56-degree wedges will make flop shots more difficult. I hadn’t considered that ahead of time, but I’m hopeful it might actually make it easier to keep a light grip. If you work for a golf course and have any information on whether or not it will be open this weekend, please email me at wiscosportsaddict@gmail.com and let me know!